Switzerland forwards Alexander Frei and Marco Strellar have both retired from international football. It means neither of them will be available to face England in the Euro 2012 qualifier at Wembley on 4 June. The Basle duo said that jeering and and abuse from home fans played a part in their decision. 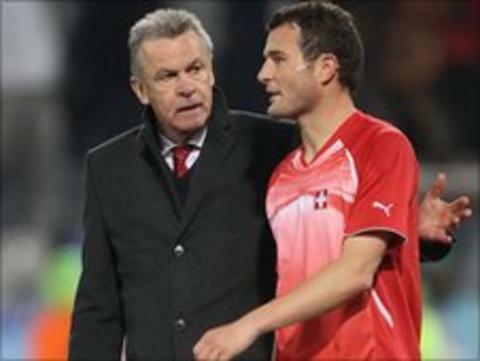 "I understand their reasons but we have a decisive match in England and I must plan differently," said Swiss coach Ottmar Hitzfeld. "I can say with a clear conscience is that I've always tried to give my best," said Frei, who is Switzerland's all-time leading scorer with 42 goals in 84 appearances. The 31-year-old played at two World Cups and two European Championships, but his final game was last month's 0-0 draw in Bulgaria. The result left Switzerland on four points, six behind both England and Montenegro and struggling to qualify for Euro 2012. Streller, 29, scored 12 goals in 37 international matches but had to pull out of Hitzfeld's squad for the World Cup in South Africa last year through injury.